We eat a lot of quinoa at our house. I can’t wait to try this recipe! This sounds perfect! I love red lentils and I’d sub in red quinoa since I like it better than the yellow stuff. I’ve never tried ricotta salata before (and I’m sure it’s more delicious than plain old ricotta because it’s dried and salted and hopefully not so bland). I love a good charming cheese. That looks yummy. I will have to give it a try. It would be great to hear a run down on some of the quick and simple summer meals you prepared in that small kitchen. Great ideas for anyone who is traveling in the summer and cooking in new places! Thanks. 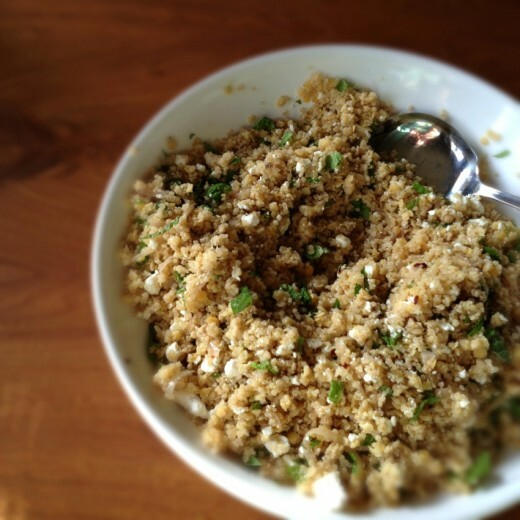 I love this method of cooking quinoa, it feels so much more natural to me! Many of mine come out rather gummy, so I’m eager to try your way Dana. So glad to have you cooking and posting recipes again! I’m imagining you in a small kitchen in France, just cooking amazing food from amazing ingredients and yes, it definitely fits. I’ll be attempting to cook (very sparingly) out of a super tiny kitchen in Florida for a week and I’ll need to channel some of your good cooking karma. I have very mixed feelings about quinoa also. Some days I love it, others…not so much. This pilaf does sound delicious, though. I’m sure it would be love at first bite! lovely! and it makes me so happy to read someone give a quinoa ratio of 1.5 to 1 liquid to dry for a bit of bite. The 2:1 is overcooked and it’s what is printed on all the quinoa packages…breaks my heart ;) So glad you’re home safe from your amazing trip. The salad looks perfect. Thanks so much for this recipe! I’ve been on the fence about quinoa – I love Heidi’s quinoa cakes but the rest I see is because it was too water logged. This was delicious – I made half the recipe using red quinoa and feta and it was wonderful. A keeper for sure.